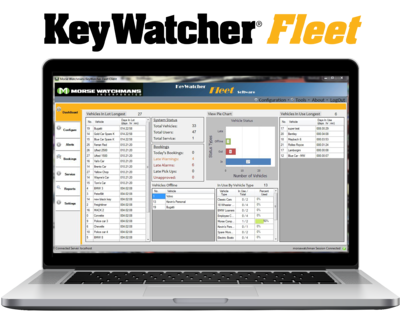 The industry’s only key control system with software designed from the ground up for fleet management applications, KeyWatcher Fleet puts you in command of vehicle distribution, comprehensive utilization, right-sizing of your fleet and much more. Get the pulse of your fleet in an instant with a convenient dashboard that displays vehicle use, bookings summary, status and a range of charts. Generate quick reports using your chosen parameters to gain actionable insights on overall operations. “Morse Watchmans Smarts” lets you create your own policies to enable automatic allocation of vehicle for each driver. Configure settings by lowest mileage, most fuel, priority, first in/first out and more. Each driver need only enter their code and the key for their allocated vehicle will be released to them. In the event a specific vehicle will not be available for its booking, drivers can be notified automatically via email or text. Built on the robust and proven KeyWatcher Touch hardware, KeyWatcher Fleet uses the same 16, 8 and 6-key modules, along with the same card and locker modules. Unique pin codes ensure only authorized individuals can access keys, or you can add an optional card or fingerprint reader for even stronger key/vehicle management. Manage thousands of keys and thousands of users with a single KeyWatcher Fleet. Like all Morse Watchmans key and asset control solutions, KeyWatcher Fleet is networkable and offers API support for integrations.